Ciabatti speaks ahead of V4 R debut: "Superbike is still very important for Ducati"
The Ducati V4 R hits the track for the first time today in MOTUL FIM Superbike World Championship guise. The machine has been hotly anticipated, and with the Bologna based squad having spent four years chasing Jonathan Rea and Kawasaki Racing Team WorldSBK, they feel this is the weapon that can finally reclaim them WorldSBK title. Those riders will be Chaz Davies and Alvaro Bautista, with Michael Ruben Rinaldi racing his first full campaign in WorldSBK for the BARNI Racing Team squad. Bautista won’t get his first taste of WorldSBK machinery until later this month at Jerez, but Ducati has high hopes for the Spaniard who battled at the front of the recent Australian MotoGP™. With Davies recovering to full fitness following an injury marred second half of 2018, the team are confident that they will challenge for the title from the outset with their MotoGP™ inspired machine. “Ducati always looks to find the best solution to offer to the customer the best possible sports bike. There are a few things we wanted to keep, mainly the Desmodromic system on the engine. Changing to a four-cylinder engine was natural because to compete on the street you need a four-cylinder like our main competitors. We had the engine designed for the GP15 as a base and that proved to be a compact, powerful base also for a production engine. 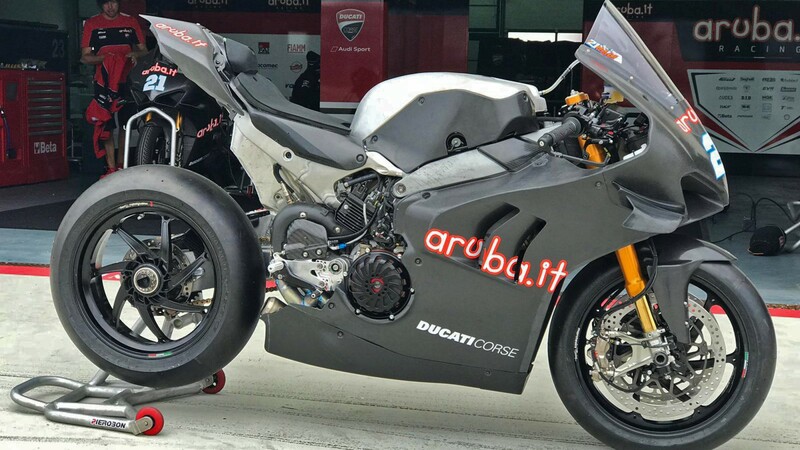 The bike features a raft of changes, with aerodynamics having been a key area of bike development for the Italians in recent years of MotoGP. Those developments have been felt with the new WorldSBK machine spouting winglets and a host of other MotoGP derived technology. Only time will tell if it’s enough to challenge Rea and Kawasaki, but with the bike on track for the first time it’s now time for the talking to stop and for the stop watch to reveal the truth about the Ducati Panigale V4 R.
Watch highlights from the V4 R’s first time out on track at MotorLand Aragon, as well as all other reactions with the WorldSBK VideoPass.